My Name is Rockin' Ron the Friendly Pirate. I am very excited about the release of my first CD "Give me an RRR!". 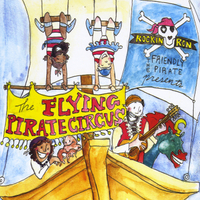 It's 18 songs offer a wide variety of Pirate Fun meant to entertain and in some cases, educate. The project has been descibed as the crew of Monty Python and the cast of Sesame Street meeting on a pirate ship and playing an eclectic selection of chanteys that kids and adults both enjoy (see more specific song descriptions below)! You may have heard of me if you've been in Northern Vermont. I spend most of my time at Smugglers' Notch Resort - America's Family Resort. I have sing-alongs with the itty-bitty Buckos, I host the Raingutter Regatta with me pal Silver Long Johns, and I entertain the families who come to the Friendly Pirate Dinner and the Friendly Pirate Breakfast at the Morse Mtn. Grille with songs, dances, and RRR-ful jokes. I have also appeared elsewhere in Vermont: the Echo Center (Aquarium) in Burlington, Vermont Lake Monster baseball games, Copley Hospital in Morrisville, Bakersfield Library, Bakersfield Elementary School, Cambridge Elementary School, The Festival of the Arts in Jeffersonville, and Keeler's Bay Market on Grand Isle. I ventured across Lake Champlain to perform for Plattsburgh New York's Mayor's Cup Regatta (a little bigger than the Raingutter Reagtta). I can be found at sea, but I have been on the air - listeners to radio stations Star 92, Champ 101, and KOOL 105 have heard the Friendly Pirate. Isn’t the name Friendly Pirate an oxymoron, like the term Jumbo Shrimp? Yes, it is an oxymoron (just don’t call me a moron, unless you want ‘MORE Ron’ – haha), but as I say in the FP Rap “I don’t have a sword and I don’t have a knife, I roll like a Pirate but I roll real nice”. Generally, pirates are defined as thieves on a body of water. There have been pirates as long as people have been sailing. The pirates we are most familiar with in Western Culture are those from the Golden Age of Piracy when the European Powers were dividing up the spoils of the New World. Listen to my song "Pirates and Privateers" to hear about some of the Golden Age Pirates. Anyway, I talk and sing like a Pirate (but no bad words), and I also dress and dance like a Pirate, but the only thing I want to steal is your heart!